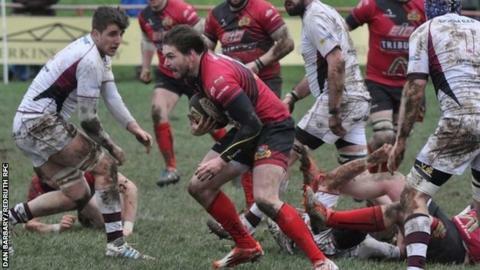 Redruth head coach Steve Larkins said his side should be in the top half of National Two South after their 8-5 win over third-placed Taunton. Nick Mason gave the visitors an early lead before Dan Rutter replied with a try back midway through the first half. Ashley Hosking's last-minute penalty sealed the win which moved Redruth up to ninth in the table. "I feel we should be in that top half of the table because we're good enough to hold our own," Larkins said. "We said before the game that it was going to be a close one that would come down to two or three points and it proved to be that," he told BBC Radio Cornwall. "In the second half we were playing against a howling wind and really dug deep defensively. We stuck at it and we thoroughly deserved it in the end."